This post is a continuation of Black Market Train Tickets, where I chronicle my month-long trip through Qinghai, Tibet, Nepal, Hong Kong and Guangzhou! 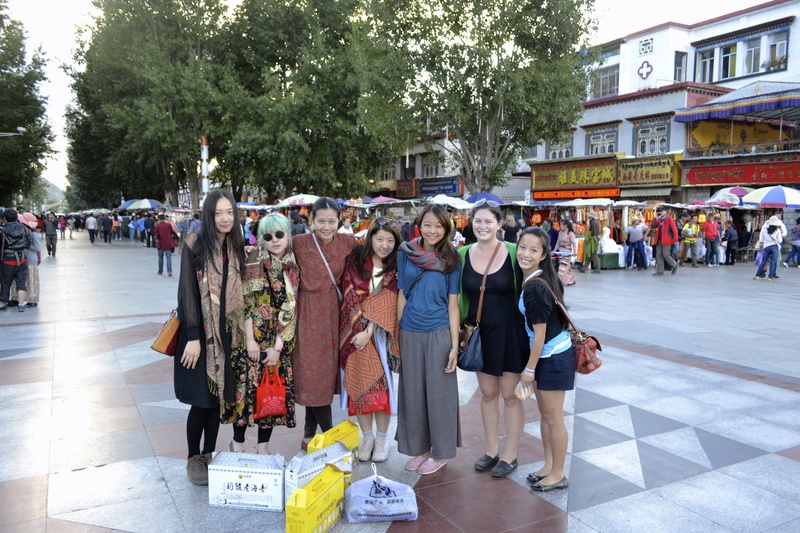 Back in Qinghai, Lumbum had emailed me telling us that we were visiting Lhasa during a special time: the Yogurt Festival! He didn’t tell us exactly what it was, but it sounded awesome. A few days later when I was arguing with him over the phone about our train tickets being postponed, in the heat of anger I said “..and you told us we would be able to go to the Yogurt Festival, and now we won’t be able to go!”, to which he replied “oh no! Yogurt Festival is week-long holiday, we can definitely take you to Yogurt Festival.” If I wasn’t so angry and frustrated, I would have laughed. From then on, my worry about missing the Yogurt Festival became a constant inside joke. Since Tibet is so far west, I was hoping that it would have an “unofficial time zone” similar to Xinjiang. While China is roughly the size of the US, it is all on one time zone, which means that in the East the sun can set very early, while in the West, the sun doesn’t rise until very late in the day. While people who work for large companies must abide by the Beijing Standard Time, most of the people in Xinjiang don’t go to work until around 10am and eat dinner around 10pm. Since I’m not much of a morning person, and we had sworn off caffeine because of the altitude, I hoped Tibet would be the same. Boy was I wrong! Tibetans are very early risers, and we met at 7am for the Potala Palace. The morning was crisp and chilly when we hailed a cab to Potala. As we walked to the Palace entrance, I was shocked by all of the older men and women in traditional garb. 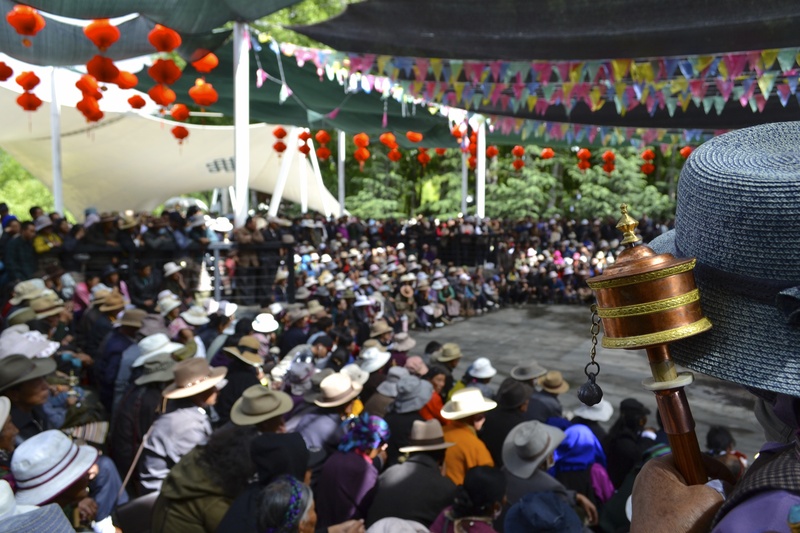 Normally in China, if you see someone in traditional clothing it’s for tourism purposes, but these men and women were circling the grounds, counting their prayer beads or spinning their Buddhist prayer wheels that look a little like oversized baby rattles. As they spin the wheel, the Ohm mantra rotates and it acts as a prayer. I was also surprised by the traditional hairstyle of the Tibetan women; even elderly women wear their hair long, braided with colored string or ribbons. Eventually we entered inside the grounds, and Denzin explained the Potala’s history. 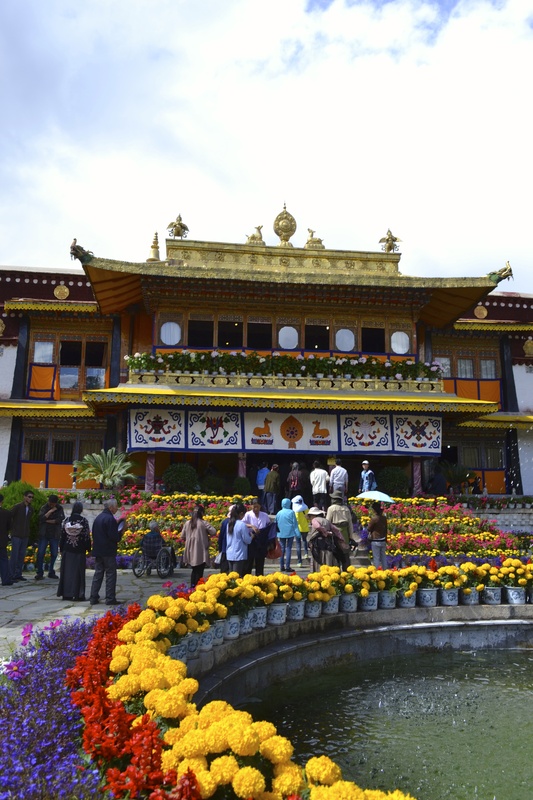 It was built by the 5th Dalai Lama in 1649 and extended in the early 1900’s by the 20th Dalai Lama. The colors of the building all have different meanings; the white buildings make up the government offices, the yellow buildings are the living quarters of the Dalai Lama and his high officials and the red buildings are purely spiritual buildings, as well as the living quarters of the monks. After a quick history lesson, we began the trek up the many staircases along the front of the building. It was rough in the altitude, and Denzin made sure to tell us multiple times “Slowly, Slowly” as he powered on ahead of us. After we huffed and puffed our way to the top, we bought our tickets and continued on inside. In the summer tickets are “timed” to manage crowd control; this means if you overstay the time on your ticket, you must pay for a second whole ticket! I was a little more rushed than I wanted to be, but thankful that the Potala was much less crowded than your typical Chinese site. We weren’t allowed to take any pictures inside the Palace, but it was beautiful, with ornately decorated rooms dedicated to individual Buddhas as well as large golden stupas honoring late Dalai Lamas. It was crazy to think that not too long ago, this Palace was the location of the head of government in Tibet. One cultural aspect that shocked me a bit, was the aggressive pushiness of the other tourists and Tibetan pilgrims. While I’m used to being jostled at Chinese sites, it was a bit alarming to be body-slammed by a small Tibetan grandma on her way to go pray. I never imagined Tibetans as the type to shove others out of the way, and a part of me wonders if this is from exposure to Han Chinese locals and tourists? I’ve seen this behavior in other Buddhist temples across China as well. Imagine touring a famous cathedral in Europe, and while admiring the beautiful artwork or a saint sculpture, a small Italian woman bulldozes you from behind, and gingerly lays her lit candle while sinking into a religious meditation of prayer. It’s a bit alarming. On the way out of the temple, the group of us missed our labeled exit time by two minutes, and were detained while Denzin had an animated argument with the ticket woman, trying to convince her that we were held up at the exit by the long line. Due to his impressive charms, we got out of paying for a second ticket. Whew! 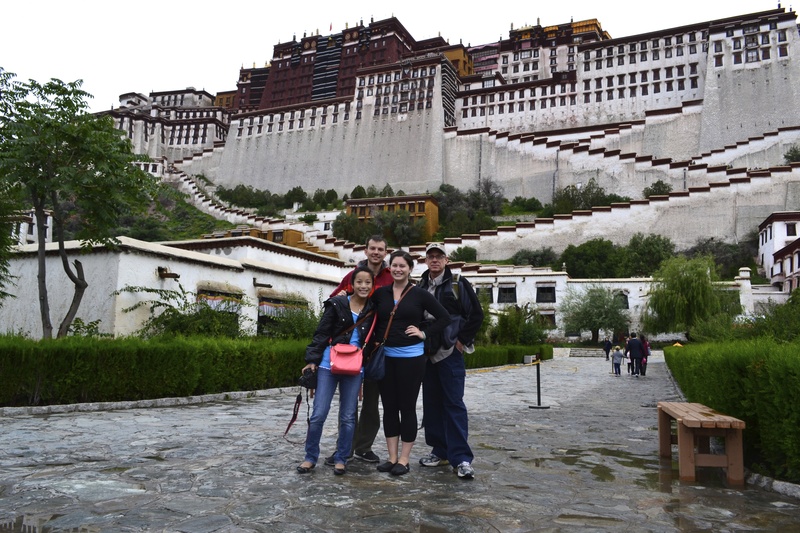 As we exited the Potala Palace I was shocked by how beautiful the view was! The morning fog had burned off, and it was a beautiful, warm, sunny day. 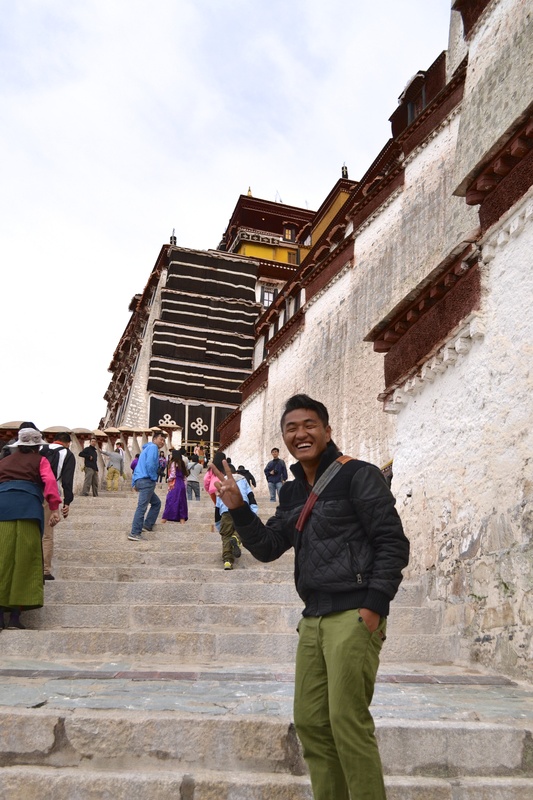 We had a few photo-ops with Chinese and Tibetan tourists, which Denzin found hilarious. I felt a bit bad for Yoko though, being Asian she knew the others didn’t want her in their photos because she doesn’t look foreign. I begged her to come join us in the pictures, but she offered to take some on my camera for me instead. Pros of being an Asian in China: you’re not a constant spectacle; Cons: sometimes it’s fun to be a spectacle. After exiting the grounds, we passed by a traditional dance performance. Many Tibetan tourists were in town for the Yogurt Festival, and the city was littered with performances. It was almost impossible for Yoko and I to see, but I was impressed by the elaborate costumes and music. Pressed for time because our Lhasa tour was cut a day short, the group of us wandered through the city towards the Jokhang Temple, the most important temple in Tibetan Buddhism. Outside in Barkhor Square, there was a line of people prostrating themselves in the traditional Tibetan prayer. The process involves standing up, kneeling and then laying oneself facedown on the ground. 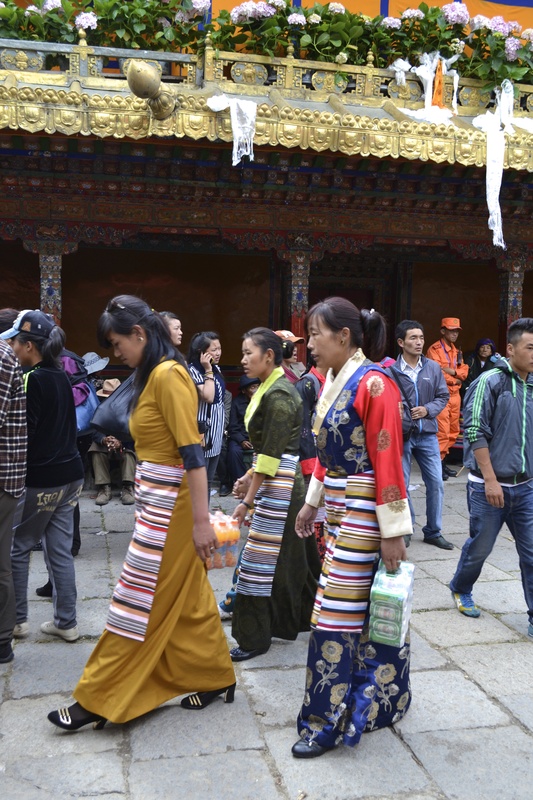 Many Tibetans make holy pilgrimages in this fashion, where they travel to Lhasa repeating this process over and over. They wear pads on their knees and wooden blocks on their hands. 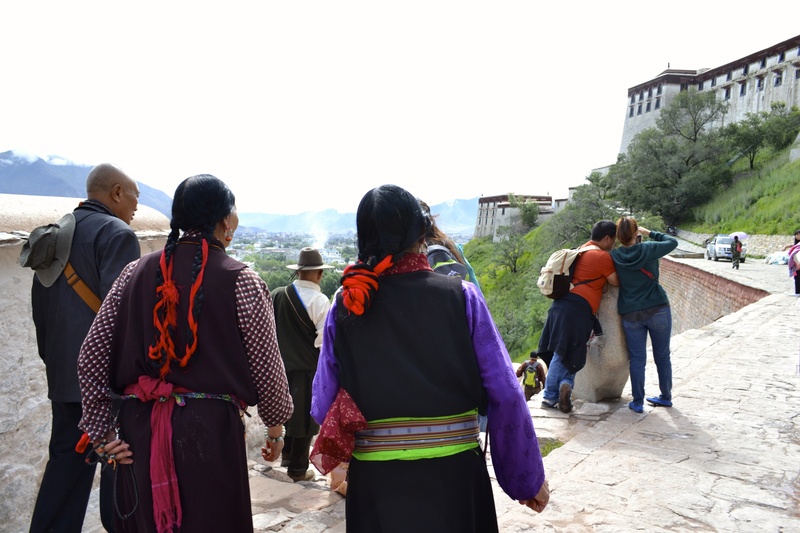 Sometimes these pilgrimages can take months, and if the person dies, his or her family will take the teeth of the deceased to Lhasa, so that they will have completed the pilgrimage in spirit. People may choose to complete the pilgrimage by walking, but prostrating oneself gives greater spiritual merit. Tibetan pilgrimages are also different in that there are many types. People will make pilgrimages to manmade sites, holy cities, important spiritual people and holy natural sites such as Mt. Kora. After exploring the temple, we headed to Lumbum’s house for lunch where, like I said in my last post, we ate an amazing lunch and were informed that we bought our train tickets from the Chinese mafia. During lunch we decided that it would be impossible to push back our trip an extra day because Kirk would miss his flight out of Kathmandu, so we decided to cram two days of Lhasa into one! We would be visiting everything except a temple where we could see monks loudly arguing Buddhist philosophy. While it would have been amazing to see, at least we weren’t missing the yogurt festival right??? Kidding. But after lunch my dreams came true and we headed to the yogurt festival(!!!!) which coincidentally, was in the grounds of Norbulingka, or the “Summer Palace”. While most people view the Potala Palace as the main landmark in Tibet, the Potala is considered the “Winter Palace”, while Norbulingka is the “Summer Palace”. As we entered the park I had a splitting headache; Apparently the altitude will do that to you. I was about to buy a water but Denzin informed me that sugar would make the pain go away, so I chugged an overly sweet Nestea. I don’t know whether it was the sugar of the placebo effect but soon enough I was feeling a bit better. I felt like I was back in China again when we entered the park. There were people EVERYWHERE; however, there was a much more relaxed, friendly and easygoing vibe compared to most Chinese tourist sites. There were people selling food and toys on woven blankets, young married girls laughing over tea and almost everyone was in traditional garb. The temples were packed, but it was so interesting to see the festivities. When I asked about the traditional garb, Denzin told us that the women with striped aprons were married, while the women in wrap dresses without an apron were single. After hearing this I was shocked by how young some of the married women looked; but in Tibet many people get married as soon as they become adults. Denzin is twenty-four, and told us he’s married with a two-year-old! While I am getting to the age where I’m starting to see weddings pop up on my Facebook newsfeed, it’s still a little uncommon, at least where I’m from, to get married when you can barely legally drink… although that’s not really an issue in China. The last place we explored in the park was the living quarters of the Dalai Lama. 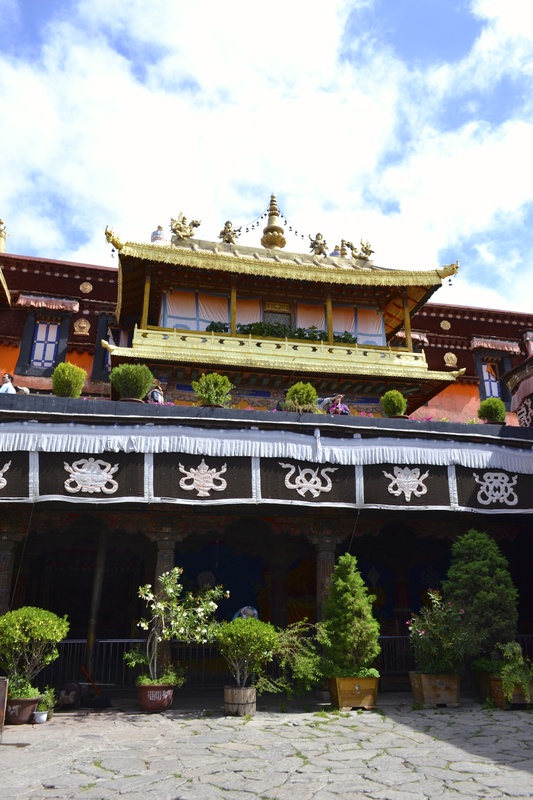 The Dalai Lama was living in Norbulingka when he was forced to leave China; As you enter into the house, there is a large clock on the back wall with the time frozen at the exact hour in which he fled for India. The one thing that really bothered me about visiting the Dalai Lama’s home was seeing Chinese tourists. Many Chinese people (including my extremely sweet and harmless language partner in Beijing) believe that the Dalai Lama is a “horrible person that is trying to tear China apart”, but that didn’t seem to stop hordes of Chinese tourists from coming to “oooh and ahhh” at the childhood home of the religious and political leader their country has forced into exile. 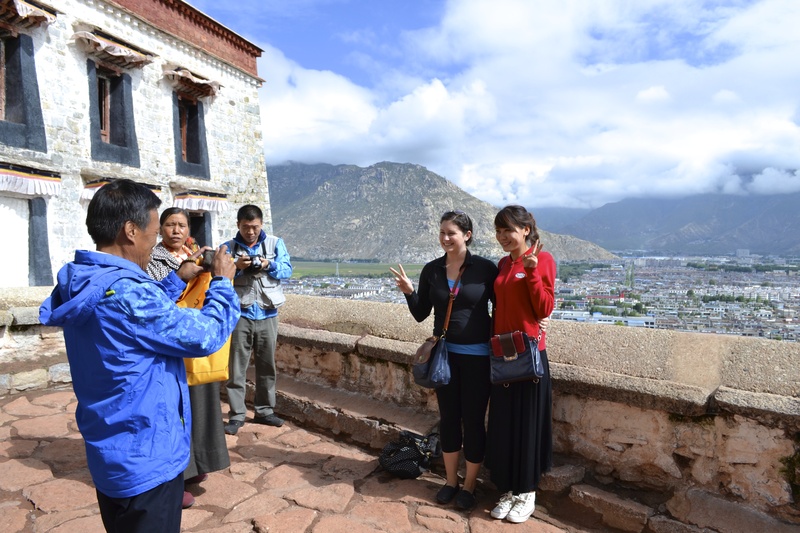 Seeing Chinese tourists in Tibet at all is very awkward and upsetting. They come for the beautiful air and scenery their country hasn’t yet polluted as well as to see the beautiful temples their parent’s generation tried to destroy. After wandering the Dalai Lama’s home, we explored the festival a bit. One thing that was a bit strange about the Yogurt Festival is that there was only one stand of yogurt. Why would they call it a yogurt festival if there’s no yogurt! While I was a bit disappointed about the yogurt, seeing the festival was still extremely interesting. After the festival, we had free time to explore the city. We came back to the room for a quick nap, and then wandered back to the area of Norbulingka, where Denzin had recommended a restaurant. The one thing that’s great about Tibet is that Tibetans eat a lot of Nepalese and Indian-style curries! 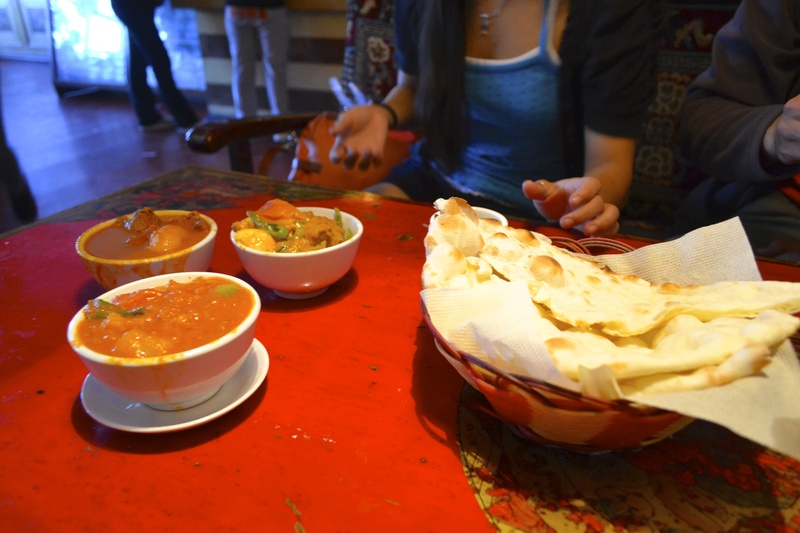 After over a month of Chinese food, affordable curry was a great surprise. We stuffed ourselves to the brim and relaxed over tea with a random cat that may or may not have belonged to the restaurant. After dinner we wandered the night market where we saw hundreds of beaded bracelets, scarves, and prayer wheels, as well as many young Chinese women getting their hair braided like they were in Mexico; except instead of beads they used colored string. We had a great time wandering the market, buying jewelry and souvenirs and meeting cool people like a group of hipsters from Hong Kong and a guy who told us he taught “Tianjin hua” and that Mao was his uncle…. Yeah, sure buddy. The three of us stayed out way too late, seeing as we had to be up at 5am to see a convent in the morning before we left Lhasa. What an amazing adventure you were on! Love to see your pictures too!